What will our new library look like? 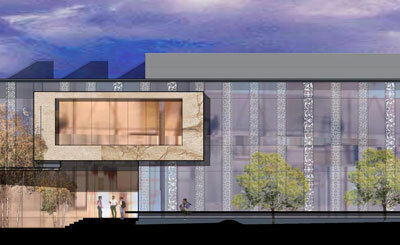 It will be a welcoming, beautiful public space. The two-storey modern design features limestone sills, terracotta columns and expansive windows. Alternating bands of glass along the south and east sides of the building will feature etchings inspired by the elaborate designs that adorned book bindings in the age of Stephen Leacock. Skylights, a fireplace, and a room stocked with rare books are also planned, and design details include a terraced garden, water feature and public art. There will be two program rooms for community activities and our regular popular programs, including author readings, monthly speakers, genealogy classes, book clubs, gardening classes and gaming tournaments. The rooms will also be able to host and accommodate the Battle of the Books finale, the Summer Reader's Club and the Explorer's Club. A dedicated children’s program room will provide ample space for small group programs in a closed area, enabling children and parents to focus on presentations. A special area just for teens will host a variety of popular material, a cyber-café computer zone and welcoming seating for gathering and studying. A 24-hour book drop with a stopping zone on Andrew Street will allow drivers to return materials at their convenience, quickly and easily.?? A computer training room will offer many learning opportunities from introductory skills such as setting up an email account to advanced classes and workshops on database and web searches, as well as on-line catalogue use. A dedicated local history room will feature proper archival storage and improved access to local historical documents. Information Orillia will be housed on the main floor of the library offering the community accessible space for assistance in finding local information. The new Orillia Public Library will be built to achieve LEED® Silver Certification through the Canada Green Building Council. To do so, the library design must demonstrate a commitment to sustainability by meeting criteria for environmental responsibility and energy efficiency. Energy savings, water use reduction and reuse, architectural integration with the surrounding area, promotion of alternate transportation and the reduction of overall impact on the environment are all aspects of our “green" library. 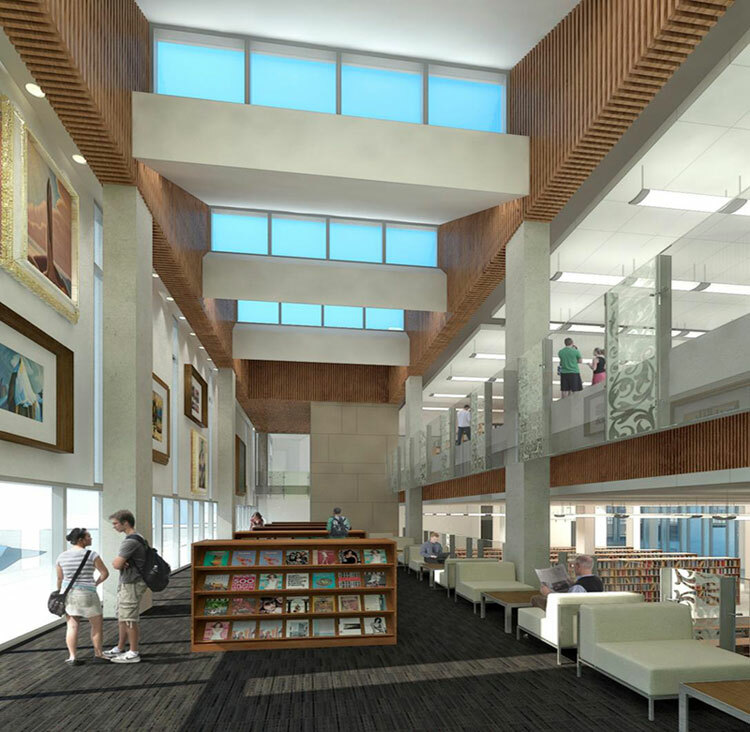 Above all, the library will be a safe, welcoming and open environment that is filled with natural light, comfortable seating and noise calming features. The windows and doors at the new Orillia Public Library are designed to have low heat loss, high daylight transmission and low solar heat gain. The design goal was to maintain comfort with the most environmentally-benign fuel available (natural gas) and with energy-efficient equipment. The building design uses radiant heating and cooling (rather than forced air systems) to achieve greater energy efficiency, reduce the use of motors, superior comfort, and zone temperature control. The library design shows that public spaces can be attractively lit through daylight, energy-efficient light fixtures and task lighting. Electricity use for lighting is 50% lower than that typically used in other libraries. The new library is also water conscious with an estimated 72% reduction in potable water consumption over conventional buildings. The location has a relatively low impact on the environment. All construction materials, fixtures and furnishings are sourced as locally as possible. Floor materials, furniture and fixtures are all low VOC and adhere to the strictest environmental standards.